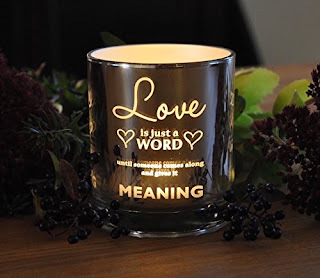 This pretty Romantic Quote Tealight Candle Holder can be used in many places in your home and outside. Can be used as a centerpiece, on a shelf, dining table, etc. It's pretty etched glass that says "Love is just a word until someone comes along that gives it meaning" How sweet is that? Makes a nice gift , even a wedding gift.